Until this recent business trip I had never been to Memphis. Fortunately for my employer I was able to stay in the very hotel where my 2-day seminar was hosted. Unfortunately for me, it meant I had no excuse to rent a car. That meant any BBQ tourism I wanted to conduct would involve being creative about how I got around Memphis. I made a comment on Facebook about my trip. My old high school friend, Lester Miser (who asked that I use this particular bloggonym) used to live in Memphis; and saw that I was en route to this barbecue Mecca. He sent this amazing guide to eating in Memphis. It has been eight years since I have been to Memphis, but this should get you started. Some of the places might be out of business, so check before traveling. I will know if you do not listen to me because you will return to Charlotte the same person. When we return to Memphis, I will consume at least 5,000 calories a day. You should too. This is our absolute favorite. The best pulled pork shoulder in the world. The best Memphis-style sauce. 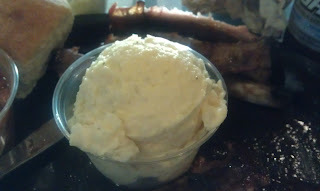 Best banana pudding in the world (if you do not have room after eating, get it to go). Great Potato Salad. This is the first place [spouse] and I will visit upon returning to Memphis. You will smell like bar-b-q for the rest of the day if you just walk in the place. It is also about eight feet from a major railroad line. The whole building shakes. 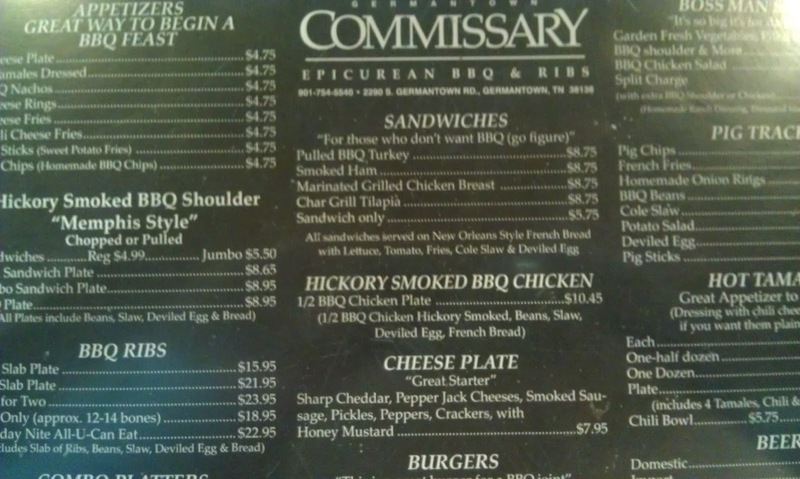 The Commissary is on the east side of town (far from downtown), but is worth the trip. It is sort of near the airport, so you might want to schedule it for the way in or out, but do not miss it. Best ribs in town. This place can be hit or miss. When they get their ribs right, you cannot beat them. About 40% of the time we go there the ribs can be a little dry. 60% of the time they are amazing (juicy and cooked to that perfect pink color). If you get there for lunch early on Friday (before 11:30), they give you a delicious bowl of red beans and rice for free. They may have it for Saturday lunch. They are closed on Sunday’s. Lunch is only available on Saturday and Sunday. Try to get a table towards the back on the right hand side. That is where the best waiters are. Be ready to order; they do not like to wait. All you need to say is, “A pitcher of Michelob, a cheese plate, and full orders all the way around.” Trust me. It is down a dark alley across from The Peabody Hotel downtown. The restaurant is downstairs and the waiting area is own the main floor. More character in here than any place in the world. All of the waiters have been there for ever. Look up at the charred joists in the ceiling. Best all around Bar-B-Q. They have something called Bar-B-Q Spaghetti that you must try. I know it sounds terrible; but trust me. Get a small order as an appetizer before you order your meal. It is noodles with their sauce and pieces of pork shoulder. It goes great with grape soda, but doesn't all barbeque? I get it as my main course, but everything is great. It is located a few miles south of downtown, about a third of the way down to the casinos. The areas between downtown and the restaurant are a little like Detroit. You generally want to stay away from the areas in Memphis that are around the intersections of numbered streets and the streets named after states (i.e. 2nd and Louisiana). There is a reason this place has been in business since the twenties. This is a meat and two (vegetables) that is only open for lunch Monday through Friday. The menu is different each day. Thursday is the best day (red beans and rice). Friday is corned beef and cabbage. They have multiple items each day, but this is what you need to order. Get the soup as one of the vegetables; it is great everyday. They also have the best sweet tea and cornsticks. The Little Tea Shop is between Main and Front downtown. McEwen's on Monroe is my favorite of the more upscale dining restaurants. 122 Monroe Avenue. Buckley’s Downtown has a good jambalaya for lunch. Dinner is O.K. 122 Union Avenue. Automatic Slim's has a crazy menu of things of which you have never heard. 83 S Second Street. The Peabody Hotel used to have the greatest bartender on earth, Rosco, before they fired him for overpouring. The lobby is still worth checking out, skip buying a drink. Gus’s Fried Chicken used to be way out in the country in a shotgun shack until it burned down. Now they have a location downtown. No one knew about this place until it was featured in Esquire magazine. 310 S Front Street. The Flying Saucer is a good place to catch your breath. It is a bar with over 300 beers. Elliot’s is place for a sandwich. Lunch only. 16 S Second St.The Cupboard Too is another good meat and two. Wednesday = Chicken and Dumplings. Lunch only. 149 Madison. Dyers Hamburgers is a classic Memphis hamburger joint. They deep fry their burgers (not breaded) in grease. The other interesting fact is that they have never changed the grease. They have strained it and added more, but never completely exchanged it. They first opened in 1912. Yes the grease is that old. The burgers are very tasty. Do not go to the location on Beale Street. It is a counterfeit. The real location is 1785 Stage Road on the northeast side of town. Memphis Pizza Café is our favorite pizza in Memphis. They have four locations in town and they are all good. The Glass Onion has great outdoor dining in the Cooper-Young District. 903 S Cooper St.
Café Ole has great Mexican also in Cooper-Young. 959 S Cooper St.
Is that the greatest, most thorough eating guide you've ever seen via email? Did I mention I was in Memphis for only 2 and a half days? 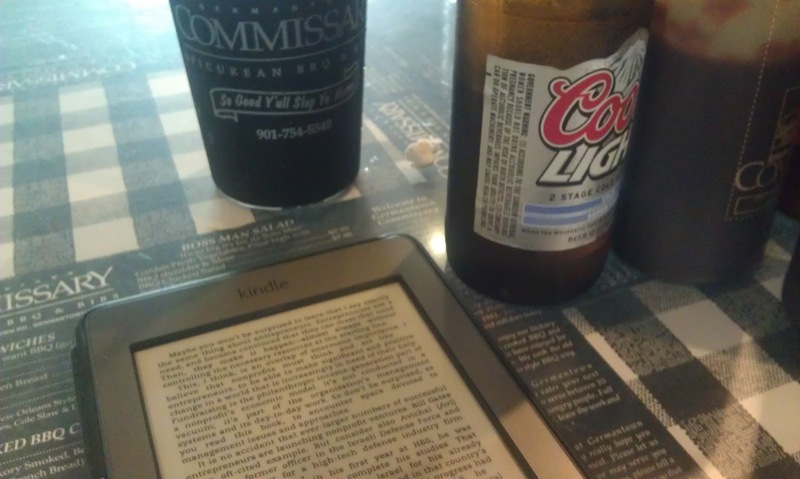 I wasn't staying anywhere close to downtown, so I chose stuff nearby--starting with the Germantown Commissary. I took a cab. First impression? Was pleased to be served water in a stadium cup I could take home as a souvenir. Also, in any classic BBQ shack I've visited in NC, the hardest stuff on the menu is Mountain Dew or sweet tea. Look! A beer! So we're off to a good start. Menu: There's stuff on here that I just don't typically see on BBQ menus in NC; things like "Cheese Plate" and "Hot Tamales." 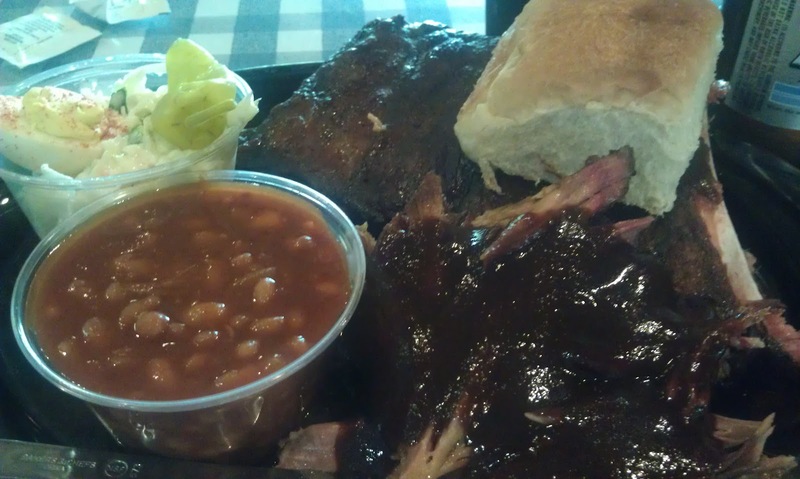 But I was here for BBQ, so I got a combo plate with ribs and pulled pork. Voila! I sent this pic to Lester. He reminded me to get the potato salad. Voila! I got a side of potato salad too. 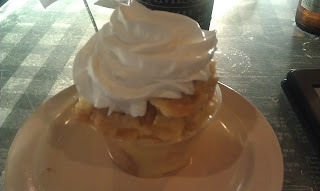 I was miserably full, but I had to try the banana pudding. As my grandfather would have said, "I was suffering with comfort." So how was it? Really really good. Being used to a thin, vinegary sauce, the heavy, thick sauce was tasty, but made it hard to appreciate the pork itself, which was very tender, moist and yummy. The ribs were also very good and some of the best restaurant ribs I could remember having. Smokey, tender and flavorful without being over cooked. The potato salad? It was fine. But I'm not such a fan of potato salad to begin with. Glad I tried it, but it didn't change my life. The banana pudding was very good. I cannot abide banana pudding made with under ripe bananas. This stuff was appropriately mushy and delicious. I got a cab back to my hotel and concentrated on digestion. For lunch the next day I went off script from Lester's email. A guy I knew from an old job, with whom I've kept in touch lives in Memphis. He picked me up and we ran off to Corky's. This place was very close to my hotel. 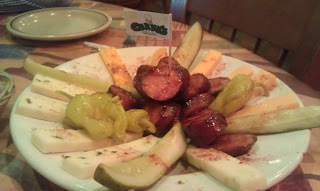 It also came highly recommended from another good friend of mine who grew up in Memphis. Curiosity won out and I got a cheese plate. To my companion who was just out for a weekday business lunch I'm sure my ordering seemed gluttonous. I reckon it was. Anyway, cheese plate? Very nice. The sausage was particularly good. But how much cheese can you really choke down enroute to another combo plate? Here we go. This was the first time I'd ever had ribs "dry rubbed." I knew that was a Memphis thing, but I didn't understand what it meant in practice. All's you do is put the rub on right before the ribs are served. So the rub is . . . dry . . . and sticks right to the sauce. I really liked it quite a lot. It changes the texture in a dramatic way and the flavor pops just a little more when the sweet rub granules hit your tongue. 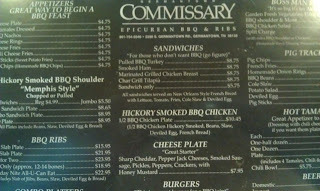 In terms of the actual quality of the pork, I liked the Commissary better. Corky's was just a little dryer like everything might've been a little bit over cooked. Trust me, I still ate it all up with great enthusiasm. I would certainly go back to Corky's. That night for dinner I walked to a Whole Foods near my hotel and had a salad. I just couldn't do another barbecued food. I needed some fresh vegetables. Sorry. In fact, as I went to the airport the following day I was battling some nagging thoughts of regret. This concept of BBQ spaghetti intrigued me. It totally sounded terrible just like Lester acknowledged. But where and when might I try something like it if I left town without it? Well I was trying to come to terms with these thoughts when a poster in the airport caught my eye. It advertised that Interstate BBQ now had an airport location. Hey! Lucky me! Right. So it even looks disgusting, right? Click on the photo to enlarge it and get a good look. I'm here to tell you, friends. 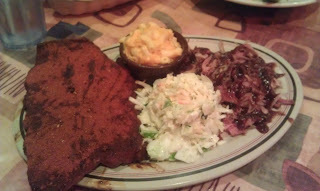 Perhaps because it was completely different, I enjoyed this the most of any of the rest of my Memphis food. It was spaghetti with a heavy tomatoey paste that instead of having traditional Italian notes, was seasoned up with everything BBQ flavored. It had bits of pulled pork in there and a very pleasing spicy kick. Yessir. I'm here to testify. Good eatin'. Of course there's a downside to everything though. This probably wasn't the best thing to eat before getting onto a crowded plane--simply for respect of my fellow passengers. Fortunately I tend to have the stomach of a goat and the flight passed without incident. I had to detox for some time after this trip, but I was thankful to get a good look at Memphis cuisine in my short time in the city. Of course I need to get back and hit the other spots on Lester's email. Would you add other spots to the list for my next visit? Thanks for reading. Sounds like you made wise use of your time. 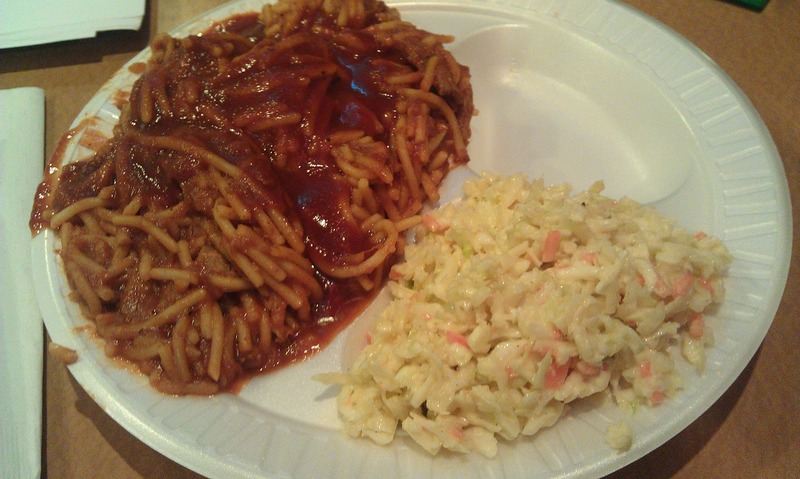 That bbq spaghetti has always seemed questionable to me but dang people love it. If I get to Memphis soon, I'm heading over to Memphis BBQ Company in nearby Horn Lake. Saw them on DDD a few weeks ago and HAVE to try it. Thanks for the tip about Memphis BBQ Company. I'll keep that in mind for my next trip. Yeah, I'm not kidding. 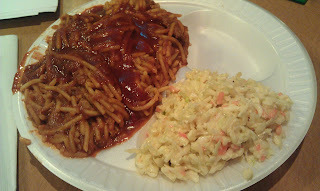 That BBQ spaghetti was something tasty. Thanks for reading, Chris.